Go on a LEGO Adventure with Johnny Thunder and all of his LEGO companions. Roam with LEGO dinosaurs or trek back in time through Egypt, The Amazon, The Himalayas, India, and China. This is a BRAND NEW set of LEGO® Adventurers Amazon 5925 Pontoon Plane from 1999. This set is still factory sealed and the box is in good condition with minor shelf wear. 71 pieces and 1 minifigure©. 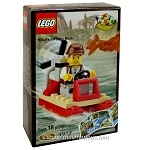 This is a BRAND NEW set of LEGO® Adventurers Amazon 5936 Spider's Secret from 1999. This set is still factory sealed and the box is in very good condition with minor shelf wear. 126 pieces and 3 minifigures©. 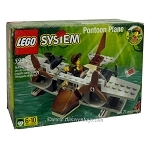 This is a BRAND NEW set of LEGO® Adventurers Amazon 5925 Pontoon Plane from 1999. This set is still factory sealed, however the box is in rough shape with wrinkles, creases and shelf wear. 71 pieces and 1 minifigure©. This is a BRAND NEW set of LEGO® Adventurers Dino Island 5904 Adventurers Mini Copter from 2000. This set is still factory sealed and the box is in very good condition with minor shelf wear. 27 pieces and 1 minifigure©. This is a BRAND NEW set of LEGO® Adventurers Dino Island 5912 Mike's Swamp Boat from 2000.This set is still factory sealed and the box is in very good condition with minor shelf wear. 18 pieces and 1 minifigure©. 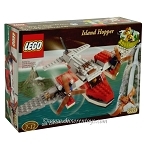 This is a BRAND NEW set of LEGO® Adventurers Dino Island 5935 Island Hopper from 2000. This set is still factory sealed and the box is in very good condition with minor shelf wear. 202 pieces and 1 minifigure©. This is a BRAND NEW set of LEGO® Adventurers Dino Island Kabaya Promotional Mini Copter from 2000. This set is still factory sealed and the box is in very good condition with minor shelf wear. 28 pieces and 1 minifigure©. 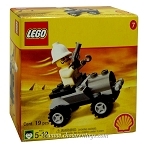 This is a BRAND NEW set of LEGO® Adventurers Egypt SHELL Promotional 2541 Adventurers' Buggy from 1998. This set is still factory sealed and the box is in very good condition with minor shelf wear. 19 pieces and 1 minifigure©. 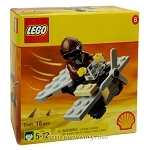 This is a BRAND NEW set of LEGO® Adventurers Egypt SHELL Promotional 2542 Mini Plane from 1998. This set is still factory sealed and the box is in very good condition with minor shelf wear. 18 pieces and 1 minifigure©. 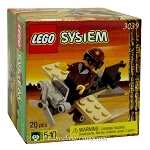 This is a BRAND NEW set of LEGO® Adventurers Egypt 3039 Nestle Promotional Set: Adventurers' Airplane from 1999. This set is still factory sealed and the box is in very good condition with minor shelf wear. 24 pieces and 1 minifigure©. 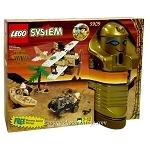 This is a BRAND NEW set of LEGO® Adventurers Egypt 5909 Treasure Raiders from 1998. This set is still factory sealed and the box is in very good condition with minor shelf wear. 192 pieces and 5 minifigures©. This is a BRAND NEW set of LEGO® Adventurers Egypt 5958 Mummys Tomb from 1998. This set is still factory sealed and the box is in good condition with minor shelf wear. 253 pieces and 4 minifigures©.